The Cultural Arts Alliance (CAA) of Walton County invites artists to apply to exhibit in the 30th Annual ArtsQuest Fine Arts Festival 2018 happening May 12 – 13, 2018 in South Walton, FL, along Northwest Florida’s beaches. 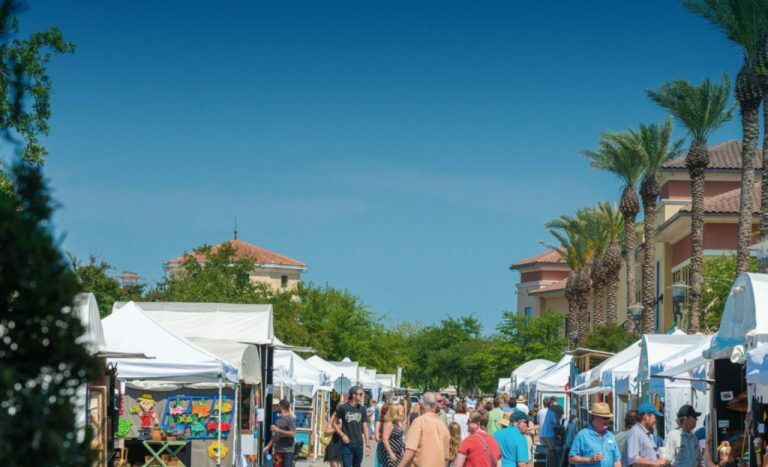 The festival takes place in Grand Boulevard at Sandestin’s Town Center. It is home to large-scale events such as the 30A Songwriters Festival and South Walton Beaches Wine and Food Festival. Located along the Scenic Hwy 98 Corridor, Grand Boulevard is easily accessible from regional drive and fly markets. These include Houston, Memphis, Atlanta, Nashville, Birmingham, Mobile, Pensacola, and Tallahassee. ArtsQuest is the kick-off event for Art Week South Walton, an initiative of the CAA. The purpose of Art Week is to bring communities, organizations, and businesses together to present quality arts and entertainment to the community. Spanning several days, Art Week will feature visual, performing, and literary arts programming in diverse formats and various venues throughout South Walton. ArtsQuest offers something for everyone. The event’s atmosphere is visually stimulating and family friendly. Adults can enjoy craft cocktails and culinary delights while strolling through the boulevards lined with fine artists. Kids will love the ImagiNation area with special activities in each of the tents. All can enjoy continuous live music throughout the festival. Highlights for ArtsQuest artists include $10,000 cash in artist awards, 5,000 quality art buyers, food vendors, and full cash bar along with existing restaurants in Grand Boulevard. Grand Boulevard and the surrounding area offer affordable accommodations, including hotels, camping, and condo and home rentals. ArtsQuest Fine Arts Festival 2018 artist amenities include conveniently located artist parking, booth sitting, overnight security, on-site continuous artist hospitality. The Cultural Arts Alliance of Walton County (CAA) supports the arts through leadership, advocacy, funding, programs, and education. The vision of the CAA is to make Walton County a creative place in which to live, work, and visit. It is a destination for cultural and artistic excellence where lives are enriched, economy is stimulated, and community is strengthened. As the creative core of Walton County, the CAA offers support, connection, and access opportunities for all forms of art, variety of makers, levels of learners, and art lovers. Through sponsorship, performance, and educational programs, the organization directly connects the people of Walton County with the broader view, critical exploration, and answers only the arts have the power to provide. For more information, contact info@culturalartsalliance.com.